Fee-fi-fo-fum! I smell big wins, so you better come! One of the most legendary English fairytales is that of Jack and the Beanstalk and while we have saw the story retold on the reel’s numerous times before (with the Jack and the Beanstalk slot machine from Net Entertainment and the Giant’s Gold slot machine from WMS) NextGen Gaming take us on a magical adventure up the beanstalk once again as we take the role of Jack to sneak into the Giant’s castle and steal some treasure – hopefully the 600,000-coin jackpot! The action takes place over 5 reels and 25 paylines with a generous 95.46% return to player percentage offered and you can spin the reels from 25p up to £50 each time. With magic beans to sprinkle and golden eggs that hatch big wins every time, you’ll never fail to have a fairytale ending of your own and escape from the castle back down the beanstalk with giant wins! NextGen Gaming have done a great job designing the symbols which boast vibrant colour and quirky animations that bring the story to life, with my only qualm being the inclusion of Ace to 10 playing card symbols as the dairy cow, Jack’s mother and many other alternatives that are related to the fairytale could have been included instead. 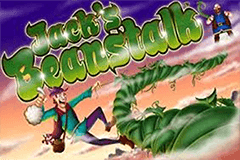 The magic beans that Jack exchanged the dairy cow for can appear on the second, third and fourth reels which brings Wild wins and sees the beanstalk sprout up, while the golden egg is the Scatter symbol and sees big wins hatched. A jovial Jack appears as the highest paying symbol with five of him on a payline worth 2,500 coins plus you’ll see the massive angry Giant, his castle, the hart that plays by itself and Jack’s mother brings an axe too! As the fairytale goes, Jack is on his way to the market to sell their dairy ow which has stopped producing milk when he bumps into an old man who offers him a deal to exchange the cow for some magic beans. When Jack returns without any money and just some ‘useless’ beans his mother sends him to bed and throws the beans on the ground, only to wake up and see a monstrous beanstalk that has grown overnight, and NextGen Gaming have done a superb job incorporating this party of the story into the game. This magical Upwild feature begins whenever you land the magic beans symbol at least once on the second, third and fourth reels. A free spins feature then begins with you receiving three free spins, which doesn’t sound very appealing at first, but when you learn that every reel that has a magic bean symbol will see a stacked Wild symbol grow from the bottom of the reels to cover it (even while you spin the reels, meaning the possibility of three reels that are all Wild) and the possibility of retriggering more free spins - it’s easy to see why this is such a magical feature! One of the treasures that Jack stole from the Giant’s castle was a goose that lays golden eggs and whenever you land the golden egg symbol (Scatter) three times or more on the reels at once you will be enjoying the Golden Egg bonus feature. This is a simple pick ‘em feature that will see you transported to the castle where you will get to choose three of the five geese to steal, with each of them offering multiplier prizes of between 25x and 250x your stake. If you aren’t satisfied with the treasure that you’ve stolen from the Giant’s castle, you’ll have the opportunity to take a risk and enter the gamble mode to transform them into wins as big as the beanstalk. There are two options available – either to double or quadruple your winnings. Doubling your winnings is as easy as choosing whether the playing card will be red or black, while quadrupling them is tougher as you must select the exact suit that it will be, but be careful not to get too greedy or the Giant will return home and grind your bones to make bread! While there have been several slots released based on the Jack and the Beanstalk fairytale, Jack’s Beanstalk is a sensational addition to the line-up. It has proved to be extremely popular at online casinos for UK players which offer NextGen Gaming slots thanks to the stunning graphics and the sensational bonus features which perfectly translate the story across the reels!